Transfer projects, clients, tags, and time entries from Toggl to Clockify. You can learn more about the tool and contribute to its development on Github. Note: toggl-to-clockify isn't developed by Clockify. Use at your own discretion. You'll need email, Toggl API token, Clockify API token, names of workspaces you want to transfer, and years to include in the transfer. Run the command in your command line to start the transfer. 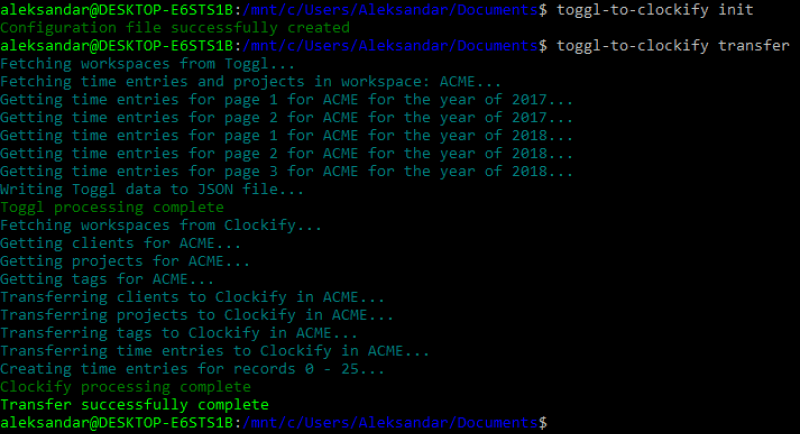 Before you initialize the transfer, workspace name on both Clockify and Toggl must be the same. The importer transfers entries for one person. If you run it multiple times, it will create duplicate entries. Web version of Toggl to Clockify importer which doesn't require any development skills is under works (ETA: somewhere in February). You can contribute to it here. For more information, visit the toggl-to-clockify Github page, report an issue, or contribute to its development.